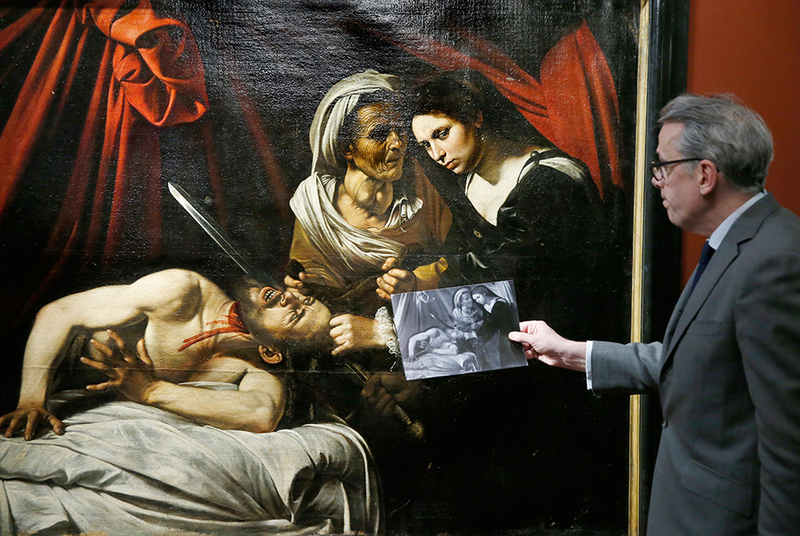 French art expert Stephane Pinta shows a radiography of the painting entitled "Judith cutting off the head of Holofernes", presented as being painted by Italian artist Caravaggio (1571-1610), while experts are still to determine its authenticity. The painting was found out in an attic of a house near Toulouse, southwestern France. PATRICK KOVARIK / AFP. PARIS.- An original Caravaggio or a master fake? This is the question that continues to befuddle art historians and experts about a painting discovered in a French attic three years ago. The 400-year-old canvas -- depicting the beheading of an Assyrian general, Holofernes, by Judith from the biblical Book of Judith -- was found in 2014 when the owners of a house near the southwestern city of Toulouse were investigating a leak in the ceiling. Discovered in remarkably good condition, the work was painted between 1600 and 1610, specialists believe, and could be worth as much as 120 million euros ($132 million). But whether the spectacular large-format canvas is the long-lost masterpiece by Italian Renaissance master Michelangelo Merisi da Caravaggio or the work of Louis Finson, a Flemish painter and disciple of Caravaggio who died in 1617, has the art community divided. Art historian Giovanni Agosti even resigned in protest over the issue when Milan's Brera Art Gallery, where he was a board member, decided last year to put the painting on display alongside authenticated works by the Renaissance master. The disputed painting hung next to the authenticated copy of the same scene by Finson from around 1607. The museum hedged its bets by including an asterisk on its caption attributing the work to Caravaggio but referring viewers to notes on its history in the exhibition catalogue, but that wasn't good enough for Agosti. Eminent French art expert Eric Turquin -- who has the backing of Caravaggio specialist Nicola Spinosa and has been entrusted with the painting -- believes however that the tableau is the true work of Caravaggio. It perfectly captures "the energy that radiates from the artwork and the expression on Judith's face," he said. Turquin, who has kept the painting tucked away in a vault at his offices, pointed to the artist's rendering of the fabrics -- the drapes in the background, the red knot near the left corner. The very creamy texture of the painting is typical of Caravaggio's pictorial style, he said. Turquin also highlighted the painter's brush strokes -- he did not draw or outline his images in advance -- noting the detailed depiction of Holofernes's short nails which he said is characteristic of Caravaggio's skill. Regardless of its authenticity, France slapped an export ban on the canvas last April after experts from the Louvre museum in Paris spent three weeks studying it. The ban is in place until November 2018. If France then wants to keep the painting out of the hands of collectors, the government will have to shell out the suggested going rate of 120 million euros. The painting should stay on French soil "as a very important Caravaggian landmark, the history and attribution of which are still to be fully investigated," the culture minister said at the time. If the painting -- which measures 144 cm by 175 cm (57 inches by 69 inches) -- is ever confirmed as an original, it would count as the biggest such discovery since another Caravaggio was discovered in Dublin in the early 1990s. Caravaggio may have painted the gruesome scene, which also features a haggard old lady with goiters -- an abnormal enlargement of the thyroid gland -- in Naples while he was on the run from a murder charge in Rome. His first version of Judith -- where the positions of Judith, in white, and the old lady are reversed -- was painted there around 1598 and now hangs in the National Gallery of Ancient Art in the Italian capital. A note addressed to the Duke of Mantua a few months after Caravaggio left Naples for Malta mentioned a painting of Judith and Holofernes, with an asking price of 300 ducats, a considerable sum at the time, which could lend further weight to the French painting's authenticity. The note also cited another Caravaggio painting, "The Madonna of the Rosary," now hanging in Vienna's Museum of Fine Arts. But Caravaggio's second Judith composition has been missing since 1617, the last time a reference to it was made. A scientific study conducted in Milan, where Caravaggio scholars gathered for a day-long conference in February, showed that the French Judith and the authentic Finson were painted using the same techniques, with the same fabrics on canvas and exhibited the same subtle changes to the original idea, visible by x-ray. These features "can be explained only if the works were painted together, side by side in the same studio" by two different painters, said a summary of the study. The report concluded that the French Judith was indeed an original, not a fake, but the burning question still remains -- was it painted by Caravaggio?